A 3D printed house, claimed to be the first inhabitable one in continental Europe, has been constructed in Yaroslavl in Russia, and is awaiting permanent habitation. At 298.5 square meters, manufacturer AMT-SPETSAVIA is also claiming that the building is the largest by surface area to be built using additive manufacturing technology. The 3D printed potion of the house was completed within the month of December 2015. The manual additions of the roof, windows, plumbing, and electrical wiring took the completion date to October 2017. 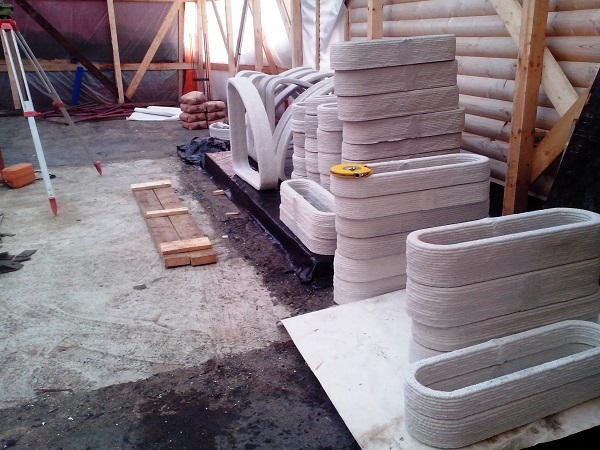 SPETSAVIA, a Russian OEM specialising in large format 3D printers, teamed up with service bureau AMT to bring functional 3D printed housing to Europe. The structure was initially 3D modelled, before being sliced using AMT’s software. SPETSAVIA then used its own S-6044 printer to manufacture the the components for the main “box” of the house using M-300, a sand and concrete mixture. The layers produced by the 3D printing process are between 30 and 50 mm in width and the z-axis 10mm in height. The walls were 3D printed at maximum speed of 15 meters per second. The S-6044 large format “portal printer” is supported by gantries, and is able to 3D print the concrete mixture anywhere within an area 3.5 x 3.6 x 1 meter. This enabled it to print the lattice-like structure of the house’s box in sections, before these sections were assembled on top of the house’s foundations. The 3D printing latticed process of the S6044. GIF via R Haria. With the roof, interior finishing work and engineering now complete after almost two years, the house is now ready for habitation by a local family. AMT-SPETSAVIA also stressed following the legal procedure for building permission and listing, the same procedure that would be followed for any traditionally constructed house. AMT-SPETSAVIA 3D printed house is a “first” in many ways. 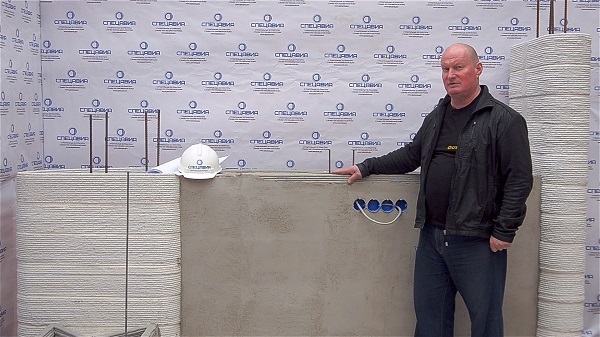 Fellow Russian company ApisCor’s 3D printed concrete show homes are not yet suitable for permanent habitation. France’s Yhnova project to 3D print social housing and Denmark’s 3D Printhuset office-apartment (itself printed using a SPETSAVIA printer) are to be manufactured by a printer on site, but they far from completion. China’s Winsun, which 3D printed an apartment block in 2015, did so also using prefabrication. Of course, any discussion about 3D printing buildings would not be complete without reference to Bherokh Khoshnevis and Contour Crafting. Khoshnevis, was one of the first to begin working on how to 3D print a building and filed initial patents in 1996. His company recently received investment and plans to ship 3D printers in 2018. Maslov with a 3D printed section of the house. Photo via SPETSAVIA. Yet despite AMT-SPETSAVIA’s breakthrough efforts, their achievement does have some limitations. Firstly, manual assembly was still required of the 3D printed elements of the house, since it was not printed on site, effectively making the process akin to prefabrication. Secondly, AMT-SPETSAVIA was unable to develop a method of 3D printing additional floors or a roof. Finally, there was seemingly no provision made to incorporate plumbing and electrics during printing. In a pre-recorded address at Codex 2017, ApisCor’s Nikita Chen-Yun Tai explained the limitations both his company and others faced with 3D printing roofs, floors, and other horizontal structures. Printing horizontal forms in situ would require extensive structural supports. With a concrete structure, removing these after printing would be both difficult and dangerous. 3D printing a roof in advance would incur even more costs for then placing it on top of the structure with a crane. Maslov acknowledged that since 2015, “the speed of printing has improved, and the quality has improved,” but nevertheless, “our first model proved to be reliable and efficient”. 3D printing technology has evolved a lot since AMT-SPETSAVIA’s efforts in 2015, and will continue to do so, potentially resulting in solutions to these horizontal challenges. Prefabrication of the elements of the house via 3D printing. Photo via SPETSAVIA. For more on 3D printed construction projects, subscribe to our free 3D Printing Industry newsletter, follow us on Twitter, and like us on Facebook. Featured image shows the completed 3D printed house. Photo via ATM.